The VB411R active video receiver receives balanced signal to converts it into unbalanced signal and raises the received signal with perfect receiving effect, which can be applied for the occasions such as video monitoring and video meeting and can transmit four channels of video image simultaneously via a 8-core Cat-5 twisted pair wire. It can simplify the wiring project and save wire use quantity. Connect the two-color wires of a pair of Cat-5 unshielded twisted pair wire to the ‘+’ terminal of the green socket and connect the single-color wires to the ‘-’ terminal. Connect the BNC interface of the receiver to the monitor or other recording equipments. If there is any joint in the circuit, please adopt welding method or special junction box to ensure perfect contact at the joint. Please be sure to connect the interface marked with ‘ ’ symbol to the ground wire of the lighting-proof system with the copper conductor with sectional area≥1.5 mm2! Adjust “BRIGHTNESS” knob to adjust the image brightness, then adjust “SHARPNESS” dial switch to compensate the image sharpness and color. The compensation size in turn is 1 as minimum and 4 as maximum. Pressing dial switch shows the compensation of this position is turned on. Next or multiple switches can be pressed according to the requirements. The four dial switches can compose 16 compensation values (as shown in the following figure) to meet the requirements of different transmission distances. Why does my video look like a scrambled Cable TV signal? This typically indicates reversed polarity. Can shielded twisted pair be used? Some customers have successfully used shielded wire up to a few hundred feet. However we do not recommend it. Its high-frequency roll-off will severely degrade the distance performance. Can Category 6 wire be used? Yes. Unshielded Twisted Pair wire, Category 5 or better, can be used with UTP video transceiver. Can I transmit more than one video signal in a multi-pair wire bundle? Yes. One of the benefits of using UTP video transceivers is interference rejection. 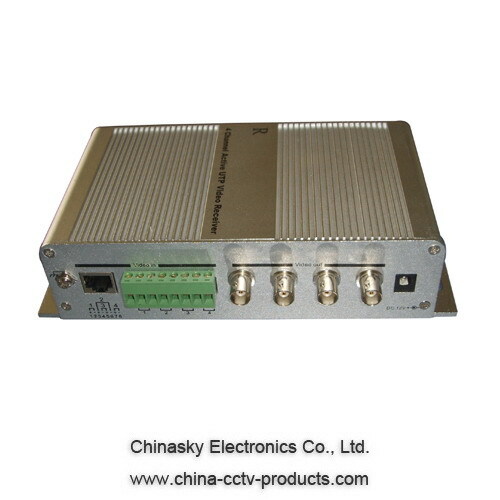 UTP video signals can reside in the same wire bundle as multiple video signals, ringing telephones, Ethernet, low voltage power, RS-422, RS-485, etc.